One daily necessity we’ve all come to love is our morning cup of coffee. While we’re out camping with the family, we don’t have the comfort of our coffee pot with us, and there’s no Dunkin’ Donuts® in the middle of the woods. So, what can we do? Well, like a good scout, we should always be prepared! Making a fresh cup of coffee while camping is easier than you think, and I’m going to show you how to get it done! A nice cup of coffee when you wake up from sleeping under the stars is a must. If you’re like me, you always end up sleeping on a giant tree root or boulder which somehow made it’s way under the tent, even though you checked every square inch of the ground before you set up camp. After waking up from sleeping under the stars and before you begin your day, you need to enjoy a cup of coffee! It’s a good thing you came prepared with single serve camping coffee pouches and Dunkin’ Donut’s® Coffee Creamer Singles! Get ready for your camping trip by preparing as many single packs of coffee as you’ll need for the entire outing. You can store them in a lidded container or airtight zipper bag to keep them fresh. 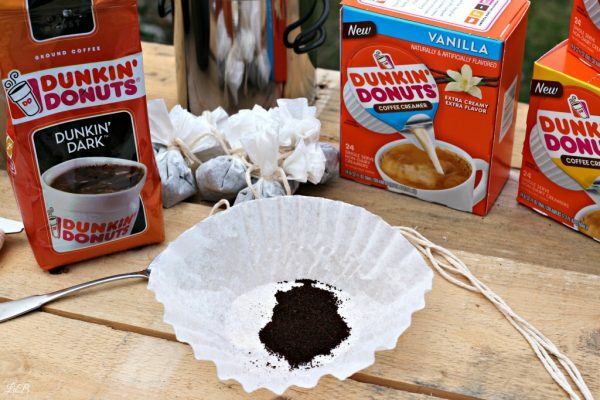 To prepare your single packs of camping coffee, you’ll need coffee filters, twine and of course coffee grounds – I love my Dunkin’ Donut’s® Dunkin’ Dark and of course Dunkin’ Donut’s® Coffee Creamer Singles will help make the perfect cup of campfire coffee. I’m taking all three of the creamer flavors, Hazelnut, Caramel, and Vanilla! We’ll begin by adding 2 tablespoons of coffee to each filter. I plan to make a cup of coffee every day while we’re camping, so I’ll make a filter full of grounds for each day. Filter size really doesn’t matter, what ever you have on hand- but I will tell you, it’s easier to tie off a 6-8 cup filter than a 4 cup filter. Next, cut pieces of twine about 10 to 12 inches long, one for each coffee pouch. Pinch the filter to create a sack of coffee and tie one end of the twine around the filter as close to the coffee as possible, leaving the rest of the twine dangling. You’ve probably realized this by now, essentially, we’re making a tea bag with coffee instead of tea. Now that we have our single serve campfire coffee packs ready to go, we just need to know how to brew these bad boys! It’s wicked easy, I tell you! First, you’ll need to have a campfire or camping stove, water, a pot to boil water in, and a mug for your coffee. Don’t forget to bring a spoon, your Dunkin’ Donut’s® Coffee Creamer Single creamers and sugar if you wish. 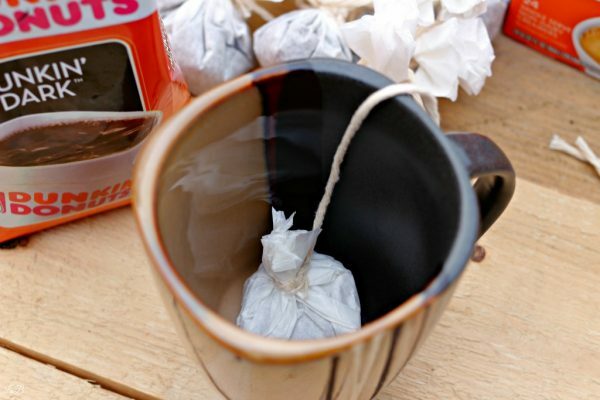 Place your coffee filter pouch into the bottom of your mug, leaving the string hanging out. Bring your water to a boil in your camping pot. 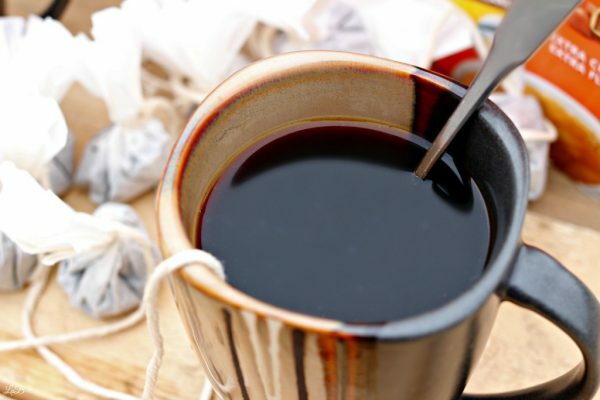 Once your water reaches a rolling boil, pour it into your coffee mug, over your filter. Use a spoon to push the filter to the bottom of the mug. Allow the coffee to brew (steep) for a few minutes, the longer it steeps the darker your coffee. You can even leave the coffee bag in the mug while you drink if you wish. 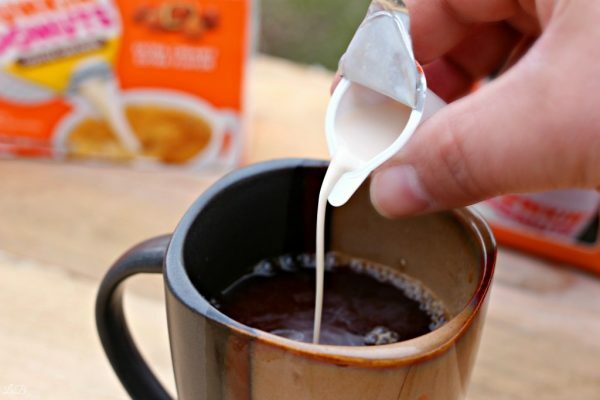 I let my coffee pouch sit for about 5 minutes before adding creamer. 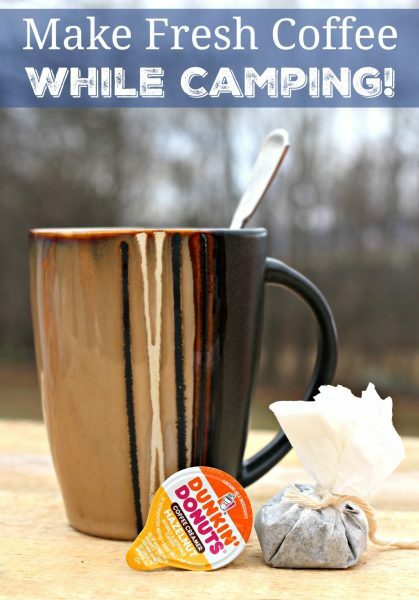 Add your favorite flavor of Dunkin’ Donut’s® Coffee Creamer Single, which are extra creamy and extra flavorful, to your cup and you have yourself a super tasty campfire coffee! 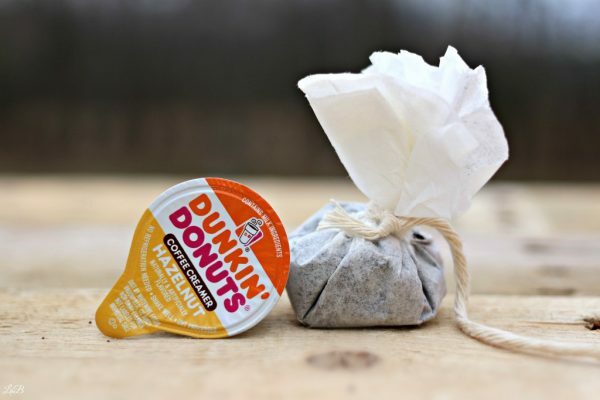 PS: There’s no need to refrigerate the Dunkin’ Donut’s® Coffee Creamer Single packs, so they’re perfect to bring camping. Enjoy your favorite Favorite Dunkin’ Donuts® Coffee Creamer anywhere! Next, kick back and enjoy! It’s really easy to make a nice cup of coffee while camping, you just have to prepare ahead of time. Don’t forget to stop by Walmart on your way to the campground and snag your Dunkin’ Donut’s® Coffee Creamer Single creamers! 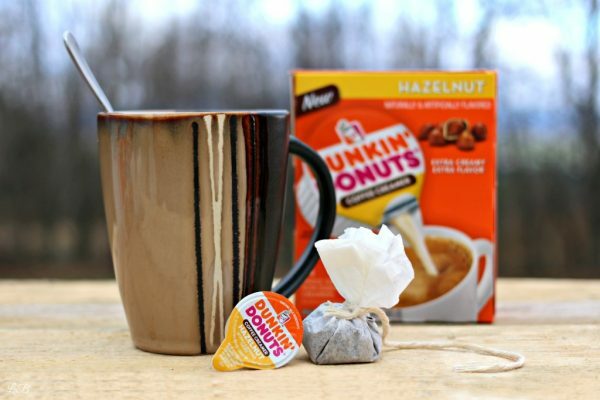 Don’t forget about Dunkin’ Donuts® K-Cups®! Do you have a Keurig® K-Cup® brewing system? 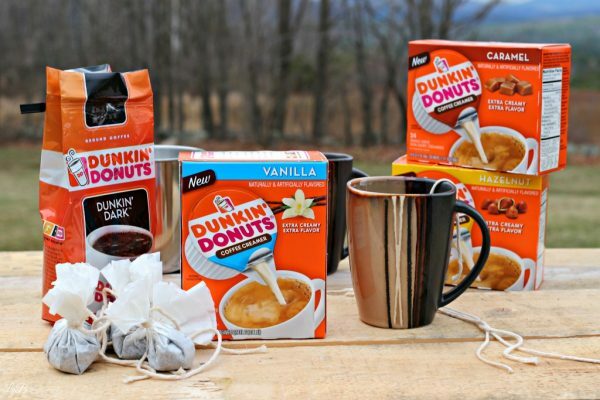 Make the Dunkin’ Donuts® coffee you love right from your kitchen. 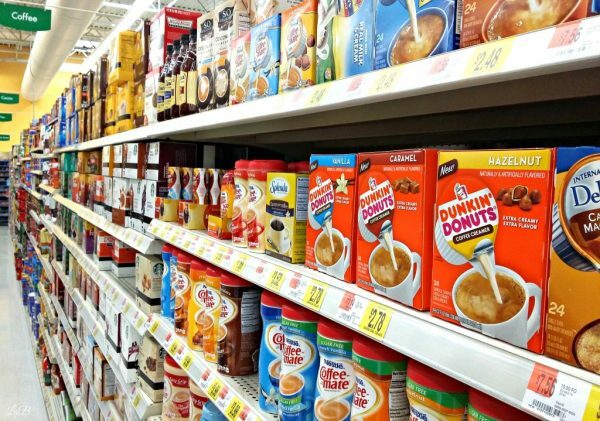 Dunkin’ Donuts® K-Cup® packs are made especially for your Keurig® K-Cup® brewing system. They come in a range of flavors and varieties. Find more fresh ideas here. 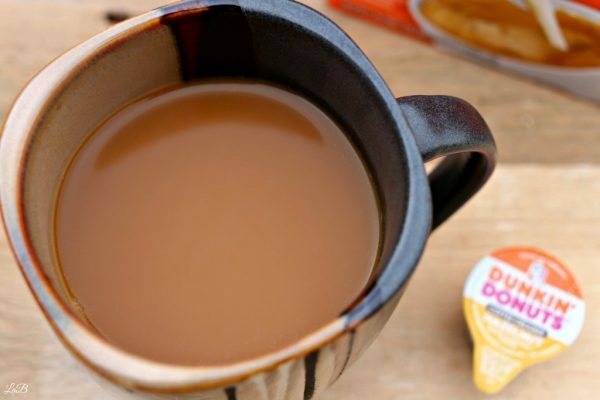 Which Dunkin’ Donut’s® Coffee Creamer Single flavor is your favorite?